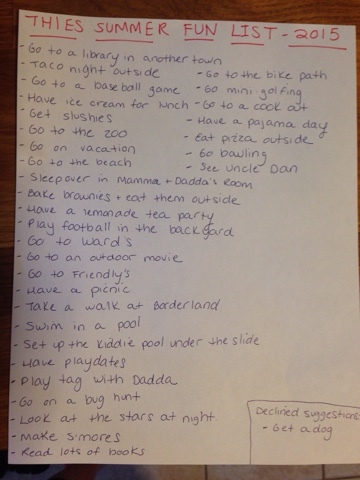 Keeping with tradition, the kids and I came up with our 2015 Summer Fun List. I try to keep us as grounded in the list as possible and veer them towards activities that we would most likely do anyway over the summer. I mean come on now, keeping 3 kids alive and occupied all summer should be an accomplishment in and of itself, no need to add on too many crazy expectations! We can't wait to start checking things off. Isabelle and I love us some lists!